It feels like it’s been ages since the last time I had bbq in the city of Atlanta and as a result, I’ve had my sights on trying Community Q. But it always seemed that fate was against me. Sometimes I would arrive in Atlanta too late, other times would simply be the result of poor planning, but last month the stars seemed to align and it was finally time for dinner at Community Q. Since Community Q was sold out of the day’s special, sloppy joe’s, I made do with a variety of their other bbq offerings. 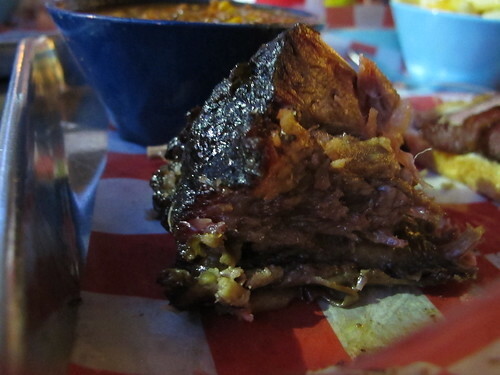 With a silky yet meaty texture, the meat on these ribs fell off the bone at the slightest tug. As far as flavor, it was almost a goldilocks situation. 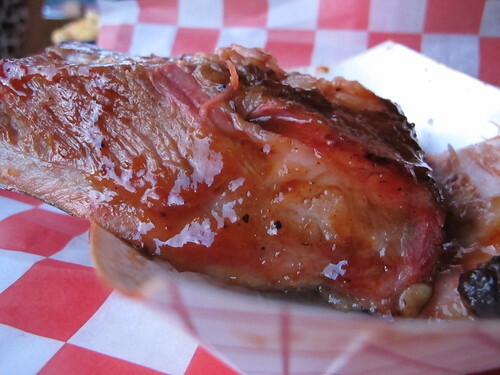 The meat was not too smoky, not too dry with a sweet but not too sweet sauce. I don’t want to call it middle of the road, but it felt like it dwelled in a comfortable medium. 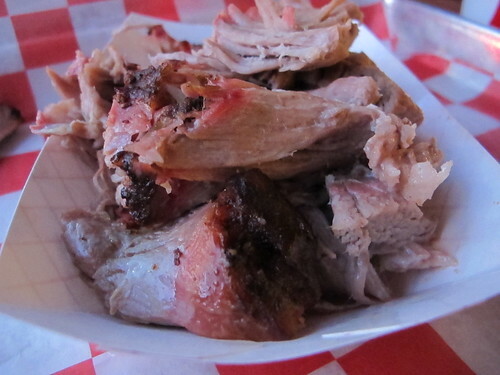 Pulled pork was next and I was delighted to see a few pieces of well smoked pork in the mix. Surprisingly, even for what appeared to be a half brown plate, there wasn’t much smokiness to the pork. Once again, the pork seemed be right in the middle of the flavor and texture spectrum. 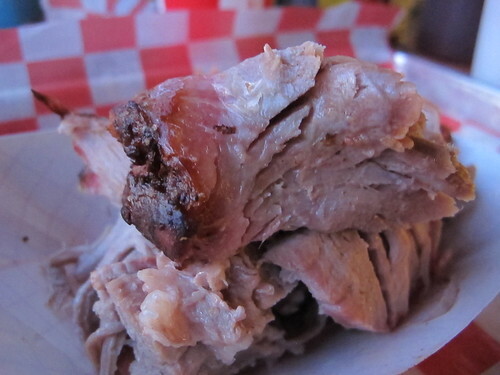 Neither particularly juicy nor particularly dry, it was a serving of fair pulled pork. What did surprise me was the choice of sauces. With the thin, vinegar based sauce the pork was brought down a level while the sweeter sauce wasn’t much help either. 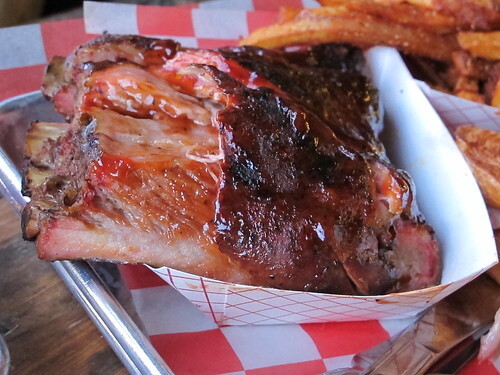 If there was one area where Community Q truly shined, it was with the beef rib. 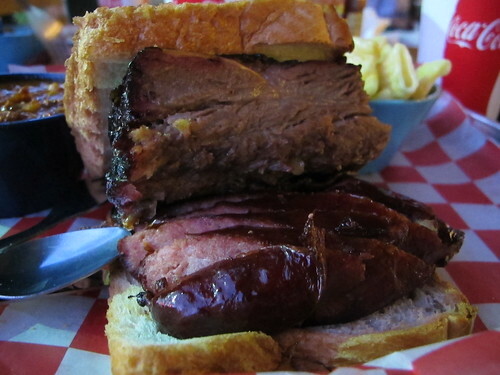 Seen here with a serving of sausage, this beef rib was juicy, tender, and most importantly brimming with beef flavor. Even with a heavily smoked edge, this beef was light on the smoke but heavy on the delightful combination of beef and pepper. Needless to say, this rib had no use for sauce. The sausage could have been another high point with its snappy casing, but it was the victim of overcooking. 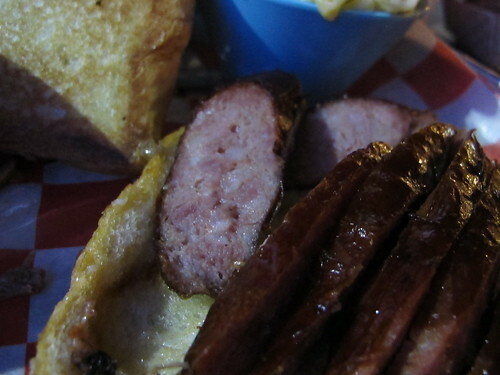 Without the unctuous texture, there wasn’t much that could help this sausage. 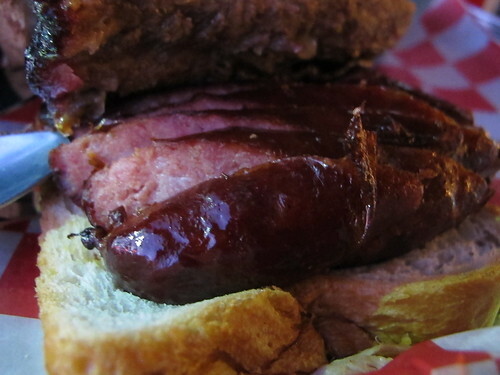 Even without a standout flavor, this sausage had potential. 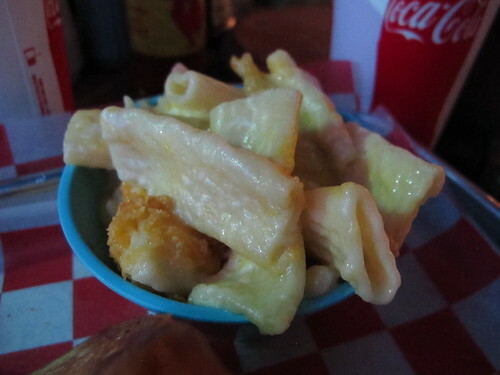 As for the sides, the mac and cheese was severe letdown. This was a tiny bowl of big noodles and a separated, oily cheese sauce. 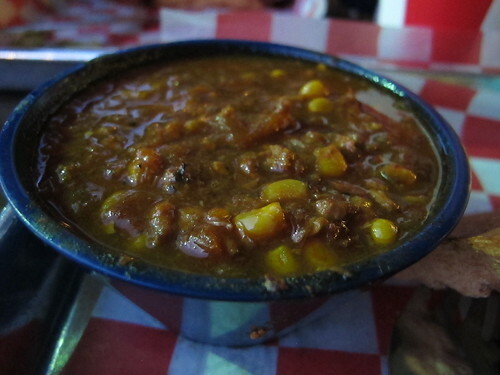 The Brunswick stew was an improvement on the mac and cheese. Plenty of corn and tomatoes with a pepper and vinegar tail made up for any overcooked ground beef. After months of failed attempts, I was a little let down to find that Community Q, did just a fair job with bbq. I wasn’t expecting a bbq epiphany, but aside from the beef rib, this was just slightly better than middle of the road bbq. Maybe I should have come earlier in the day for fresher bbq and a chance at a sloppy Joe, but from what I tried, I don’t really understand the fuss over Community Q.